The Independent Police Review Authority released a batch of videos and audio recordings from a fatal police shooting on the West Side last year. Last November, police shot and killed 33-year-old Richard Grimes, who was suspected of shooting a pregnant 24-year-old woman in the abdomen in the 4600 block of West Adams. Videos from police dashboard and body cameras show a flurry of police activity and more than 20 total shots fired at and by police can be heard as a light rain fell. The incident started about 11:30 p.m. on Nov. 27, as officers responded to a call of the domestic battery. After the initial shooting, Grimes left the scene but ran into officers in the first block of North Kenton, where he fired a handgun at the officers before running away, police said at the time. The officers chased Grimes and a perimeter of the area was established. Dashboard camera video appears to show Grimes shooting at one officer as he exited his police car. The officer immediately dropped to the ground as others arrived and looked to be checking to see if he was shot. 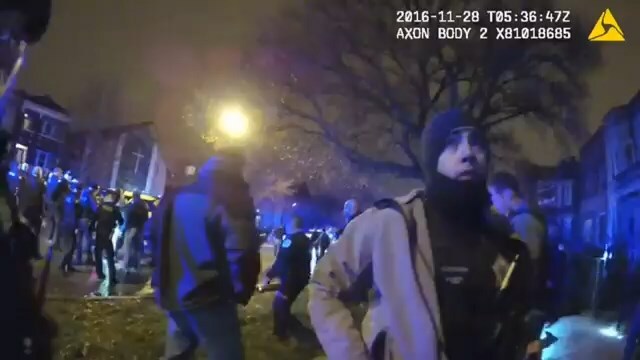 In that same body camera video, another officer asks his colleagues “Is the cop down?” and another asks “Cop shot?” Another officer walking by then said “Yeah” as others ordered their fellow cops to “Make a hole” so the wounded officer could pass through. “Who shot? Who shot?” an officer asked a group standing over the suspect, who could be seen lying in a pool of blood. “I shot,” an officer responded. “Did he shoot?” the first officer asked. “He shot at me.”One cop relayed what he saw and heard to another. “The offender was shooting. He was f—ing letting go,” one officer told another. One officer was taken to the hospital with an injury “consistent with a graze wound from a bullet,” Chicago Police Deputy Chief Al Nagode told reporters at the scene. Fire officials said that officer was taken to Loyola University Medical Center in Maywood with injuries that were not thought to be life-threatening. Nagode added that another officer was also taken to the hospital, but additional details were not released. A weapon was recovered at the scene, police said. “It’s still an ongoing investigation,” said IPRA spokeswoman Mia Sissac, who added that she was unable to provide additional details. The agency has a self-imposed policy of releasing video and police reports within 60 days of officer-involved shootings.